Whether your business is small or large, we have the Artisan Contractor Insurance that you need for your business. We can provide great rates for Contractor's Bond, Bid & Performance Bond, Inland Marine for Tools & Equipment, Workers Compensation, Insurance for Small or Large Contractors, Commercial Auto & more! Residential or Commercial we have a policy for you! Types of artisan contractors that we insure can include: Air Conditioning, Carpentry, Concrete Construction, Debris Removal, Water Drilling, Driveway/Sidewalk Paving, Drywall, Fencing, Grading, Landscaping, Masonry, Painting, Plumbing, Tile Installation & more. (Coverages may vary by state). Give Carol Stickles a call today at 951-677-3030 or complete the application below to get a quote on your insurance for contractors. 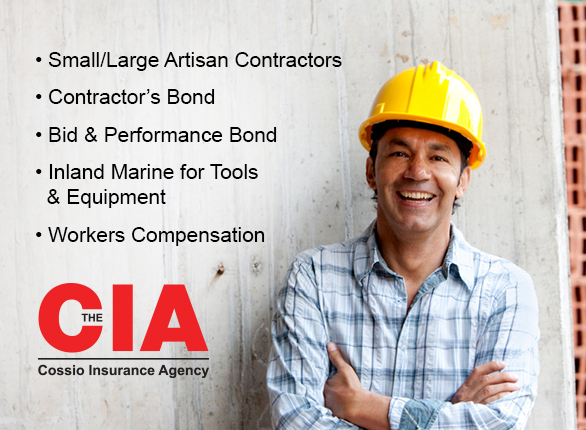 On top of your regular artisan contractor insurance policy there are some additional policies that you may need to make sure that your business is fully covered.